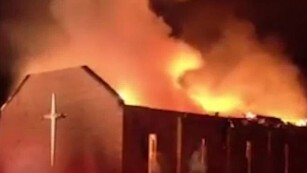 3 Black Churches Have Burned Down In Louisiana In The Past 10 Days Police Believe This Is No Accident! Fires that consumed three historically black Louisiana churches in 10 days are believed to have been intentionally set, a local elected official said Tuesday. 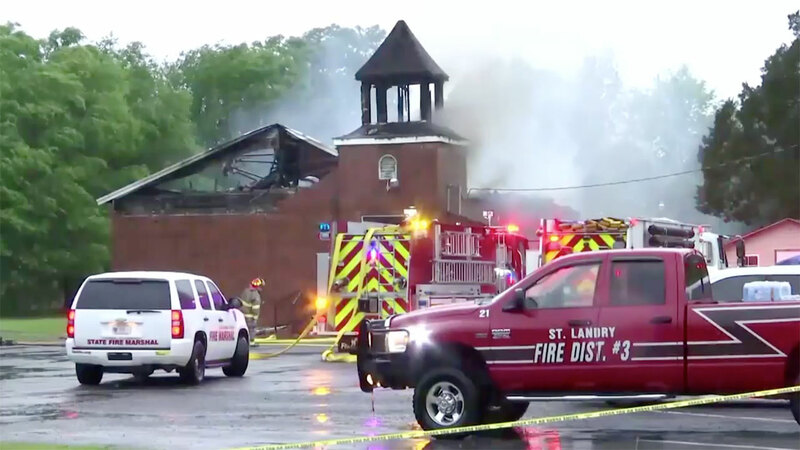 The official did not provide specifics about the ongoing investigation but told CNN some pastors in the heart of south-central Louisiana’s Cajun and Creole country are sleeping in their churches as a precaution against additional fires. It is still unclear who is responsible for the fires and will likely take investigators time to sift through what evidence remains to determine if the blazes are connected. As they do, residents and worshippers in St. Landry Parish, where all three fires occurred, are withholding judgment about what may have caused them, even as officials say they contained “suspicious elements” and the episodes evoke recollections of past acts of hate against black churches. “I feel our district was being targeted because all three of the churches were in our district,” Pastor Freddie Jack, the Seventh District Missionary Baptist Association president, told CNN’s Don Lemon on Monday. St. Mary Baptist Church in Port Barre burned on March 26, followed by Greater Union Baptist Church in Opelousas on April 2 and two days later, Mount Pleasant Baptist Church in the same town. Officials are also investigating a fourth, smaller fire on March 31 at the predominantly white Vivian United Pentecostal Church in Caddo Parish, more than 200 miles north of St. Landry. The blaze was intentionally set. St. Landry Parish is nearly 42% black. Opelousas is 75% black. “The relevance and the impact on the people in the surrounding communities and especially the congregation of each of these churches, it’s hurtful and there may be some fear that is being exhibited by those who are a part of the three churches,” he said. Hurt, fear and confusion — that’s all the congregants are left with for now. In an appeal for the public’s help, Gov. John Bel Edwards said he has directed the state fire marshal as well as local and federal authorities to “aggressively investigative” the fires. “Right now, there are more questions than answers, but hopefully the investigation will yield information we can share with the public in short order,” the governor said in his State of the State address, according to CNN affiliate KTBS. The FBI and federal Bureau of Alcohol, Tobacco, Firearms and Explosives are assisting in the investigations. And as they look for answers, congregants wait. Thomas told the news station, “It was heartbreaking, I wanted to cry, but I say I’ll hold it in. State Fire Marshal H. “Butch” Browning said in a statement there is “clearly something happening” in the community. But Jack said it’s just too early for conclusions. And the facts may take a while, because most of the evidence is likely gone. Authorities are reviewing a long list of clues. “Similar type of accelerant, any type of incendiary device that could have possibly been planted there, and then link in the houses, what things could be found at what crime scene that could be linked to another, find out if there’s a pattern and if there’s somebody here who’s a serial arsonist,” Gagliano said. About 100 federal, state and local investigators are on the case, Louisiana Fire Marshal’s Office spokeswoman Ashley Rodrigue said. Florida has sent seven people to help out the fire marshal’s office. Church burnings were a common occurrence in the Jim Crow era. And fires at black churches — especially those in the South — immediately bring to mind such racist attacks. Several black churches in the South were burned in 2015 shortly after the mass murder of nine people at the Emanuel African Methodist Episcopal Church in Charleston, South Carolina, though it is unclear if those fires were racially motivated. According to the latest data from the National Fire Protection Association, fires within religious and funeral properties have been on the decline for decades. Between 2007 and 2011, 16% were ruled intentional, according to the association. Oprah donates 2 Million dollars! First full-length trailer for Disney’s “The Lion King” is released Donald Glover Is Playing Simba And Beyonce Plays Nala!